The Elder Scrolls is a series of action role-playing open world epic fantasy video games primarily developed by Bethesda Game Studios and published by Bethesda Softworks. The series is known for its elaborate and richly detailed open worlds and its focus on free-form gameplay. Morrowind, Oblivion and Skyrim all won Game of the Year awards from multiple outlets. The series has sold more than 50 million copies worldwide. Within the fictional The Elder Scrolls universe, each game takes place on the continent of Tamriel. The setting is a mix of early or pre-medieval real-world elements, often revolving around a powerful Roman-like Empire in a world with very limited technological capabilities, and high fantasy elements, such as widespread magic use, travel between parallel worlds and the existence of many mythological creatures such as dragons. The continent is split into a number of provinces of which the inhabitants include humans as well as popular humanoid fantasy races such as elves, orcs and anthropomorphic animals. A common theme in the lore is that a chosen hero rises to defeat an incoming threat, usually a malevolent being or an antagonistic army. Prior to working on The Elder Scrolls series, Bethesda had worked predominantly with sports and action games. In the six years from its founding to Arena's 1994 release, Bethesda had released ten games, six of them sports games, with such titles as Hockey League Simulator, NCAA Basketball: Road to the Final Four ('91/'92 Edition), and Wayne Gretzky Hockey, and the remaining four adaptations from other media, primarily the Terminator series. Bethesda's course changed abruptly when it began its first action role-playing venture. Designer Ted Peterson recalls: "I remember talking to the guys at Sir-Tech who were doing Wizardry VII: Crusaders of the Dark Savant at the time, and them literally laughing at us for thinking we could do it." Ted Peterson worked alongside Vijay Lakshman as one of the initial designers of what was then simply Arena, a "medieval-style gladiator game."" Peterson and Lakshman were joined by Julian Lefay who, according to Peterson, "really spear-headed the initial development of the series". Peterson, Lakshman, and LeFay were longtime aficionados of pen-and-paper role-playing games, which greatly influenced the creation of the world of Tamriel. They were also fans of Looking Glass Studios' Ultima Underworld series, their main inspiration for Arena. Initially, Arena was not to be a role-playing game at all. The player, and a team of his fighters, would travel about a world fighting other teams in their arenas until the player became "grand champion" in the world's capital, the Imperial City. Along the way, side quests of a more role-playing nature could be completed. As the process of development progressed, however, the tournaments became less important and the side quests more. Role-playing game elements were added, as it expanded to include cities outside the arenas, and dungeons beyond the cities. Eventually it was decided to drop the idea of tournaments altogether, and focus on quests and dungeons, making the game a "full-blown [role-playing game]". Although the team had dropped all arena combat from the game, all the material had already been printed up with the title, so the game went to market as The Elder Scrolls: Arena. According to Peterson, "I think Vijay was the guy who tacked on the surtitle "The Elder Scrolls." I don't think he knew what the ... it meant any more than we did, but the opening voice-over was [changed to "It has been foretold in the Elder Scrolls ..." [Vijay Lakshman who then worked at Christopher Weaver's Bethesda Softworks came up with the name of The Elder Scrolls,, and the words eventually came to mean "Tamriel's mystical tomes of knowledge that told of its past, present, and future". The game's initial voice-over was changed in response, beginning: "It has been foretold in the Elder Scrolls ..."
Bethesda missed their Christmas 1993 deadline. The game was released in the first quarter of 1994, "really serious [mistake] for a small developer/publisher like Bethesda Softworks". The packaging included a scantily clad female warrior, which further contributed to distributor concern, leading to an initial distribution of only 20,000 units. Having missed the Christmas sales season, the development team was concerned that they "had screwed the company". Nevertheless, sales continued to grow, month after month, as news of the game was passed by word-of-mouth. Despite some initial bugginess, and the formidable demands the game made on players' machines, it became a cult hit. Evaluations of the game varied from "modest" to "wild". Still, the game maintained traction with its audience. Game historian Matt Barton concluded that "the game set a new standard for this type of role-playing video game, and demonstrated just how much room was left for innovation." A first-person screenshot from Daggerfall, demonstrating the user interface and graphical capabilities of the game. Work on The Elder Scrolls II: Daggerfall began after Arena's release in March 1994. Ted Peterson was assigned the role of lead game designer. Daggerfall's plot was less clichéd than Arena's and involved a "complex series of adventures leading to multiple resolutions." With Daggerfall, Arena's experience-point-based system was replaced with one rewarding the player for actually role-playing their character. Daggerfall came equipped with an improved character generation engine, one that included a GURPS-influenced class creation system, offering players the chance to create their own classes, and assign their own skills. 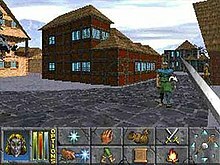 Daggerfall was developed with an XnGine engine, one of the first truly 3D engines. Daggerfall realized a game world the size of Great Britain, filled with 15,000 towns and a population of 750,000. It was influenced by analog games and literature that Julian LeFay or Ted Peterson happened to be playing or reading at the time, such as Dumas's The Man in the Iron Mask and Vampire: The Masquerade. It was released on August 31, 1996. Like Arena, Daggerfall's initial release suffered from some bugs, leaving consumers disgruntled. These early anomalies were fixed in later versions. This experience led to a more prudent release schedule for future games. Following the release of Daggerfall, work began on three separate projects at once: An Elder Scrolls Legend: Battlespire, The Elder Scrolls Adventures: Redguard, and Morrowind. Battlespire, originally titled Dungeon of Daggerfall: Battlespire, was the first of the three to be released, on November 30, 1997. Originally designed as an expansion pack for Daggerfall, it was repackaged as a stand-alone game. Battlespire focused on dungeon romping and offered multiplayer gaming—player versus player deathmatch— the only series title to do so before the release of The Elder Scrolls Online in 2014. Redguard was the second of the three titles to be released, on October 31, 1998. It was a pure action-adventure game inspired by Tomb Raider, Prince of Persia, and the Ultima series. Redguard did not offer the player the chance to create their own character. Instead, players would play the prefabricated "Cyrus the Redguard". Both games did poorly with Bethesda's audience. Players used to the vast open spaces of Daggerfall did not take well to the reduced worlds of Redguard and Battlespire. Based upon its customers' clear desire for massive role-playing game worlds, Bethesda redoubled its efforts to build the next major chapter. A third-person screenshot from the game, demonstrating Morrowind's then-advanced graphics: Pixel-shaded water, "long" render distances, and detailed textures and models. The third title in The Elder Scrolls series was first conceived during the development of Daggerfall. Initially designed to encompass the whole province of Morrowind and allow the player to join all five Dunmer Great Houses, it was decided that the scope of the game was too much for the technology available at the time. At publication, it covered the isle of Vvardenfell and allowed the player to join three of the Great Houses. The XnGine was scrapped and replaced with Numerical Design Limited's Gamebryo, a Direct3D powered engine, with T&L capacity, 32-bit textures and skeletal animation. It was decided that the game world would be populated using the methods the team had developed in Redguard; with the game objects crafted by hand, rather than generated using the random algorithmic methods. The project took "close to 100-man-years to create". Bethesda tripled their staff and spent the first year developing The Elder Scrolls Construction Set. This allowed the game staff to easily balance the game and to modify it in small increments rather than large. Ted Peterson, who had left following the release of Daggerfall, returned to work as an author of in-game material, and as a general consultant on the lore-based aspects of the work. 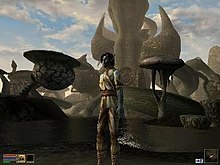 The PC version of Morrowind had gone gold by April 23, 2002, and was released on May 1 in North America, with the Xbox release set at June 7. On January 3, Bethesda announced that game publisher Ubisoft would take control of Morrowind's European distribution, in addition to those of eight other Bethesda games. The expansion pack The Elder Scrolls III: Tribunal went gold on November 1 and was released, with little fanfare, on November 6. Tribunal puts the player in the self-contained, walled city of Mournhold, which can be teleported to and from Morrowind's land mass. Development on the expansion began after Morrowind shipped, giving the developers a mere five-month development cycle to release the game. The prior existence of the Construction Set, however, meant that the team "already had the tools in place to add content and features very quickly." Interface improvements, and specifically an overhaul of Morrowind's journal system, were among the key goals. Morrowind's second expansion, The Elder Scrolls III: Bloodmoon, went gold by May 23, and was released on June 6. It had been worked on since the release of Tribunal. In the expansion, the player travels to the frozen island of Solstheim and is asked to investigate the uneasiness of the soldiers stationed there. An in-game screenshot showing Oblivion's user interface, HDR lighting and long draw distance, improvements made as part of a goal to create "cutting-edge graphics". Work on The Elder Scrolls IV: Oblivion began in 2002, after Morrowind's publication. 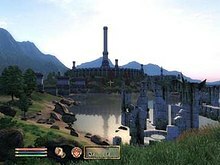 Oblivion was developed by Bethesda Softworks, and the initial Xbox 360 and Personal computer (PC) releases were co-published by Bethesda and Take-Two Interactive subsidiary 2K Games. Oblivion was released on March 21, 2006. The game centers around an event referred to as "The Oblivion Crisis", where portals to the planes of Oblivion open and release hordes of Daedra upon Tamriel. Developers working on Oblivion focused on providing a tighter storyline, more developed characters, and to make information in the game world more accessible to players. Oblivion features improved AI, improved physics, and improved graphics. Bethesda developed and implemented procedural content creation tools in the creation of Oblivion's terrain, leading to landscapes that are more complex and realistic than those of past titles, but had less of a drain on Bethesda's staff. Two downloadable expansion packs, Knights of the Nine and The Shivering Isles were released in 2006 and 2007, respectively. Knights of the Nine added a questline surrounding the search for a set of Crusader relics, while The Shivering Isles added the eponymous plane to the game. A third-person screenshot from Skyrim. In August 2010, Todd Howard revealed Bethesda was working on a game that had been in development since the release of Oblivion, and that progress was very far along. While the game was conceptualized after Oblivion's release, main development was restricted until after Fallout 3 was released. In November, Kristian West, then the editor-in-chief of Eurogamer's Danish outlet, reported overhearing a developer on a plane talking about the project; a new The Elder Scrolls game, although Bethesda did not comment on the report. At the Spike Video Game Awards in December, Todd Howard appeared on stage to unveil a teaser trailer and announce the title of the game. The Elder Scrolls V: Skyrim was released on November 11, 2011 to widespread critical acclaim. It was awarded 'Game of the Year' by IGN, Spike and others. The game is set after the events of Oblivion, when the great dragon Alduin the World Eater returns to Skyrim; a beast whose existence threatens all life in Tamriel. Three pieces of DLC were released on PC and Xbox 360 in 2012 – Dawnguard, Hearthfire and Dragonborn, with a PlayStation 3 release in February 2013. Dawnguard added two joinable factions and an associated questline revolving around Vampires, while Hearthfire added more home customisation options including a house creation kit and the ability to adopt children. Dragonborn added the island of Solstheim to the northeast. On October 28, 2016, Skyrim – Special Edition was released. On November 17, 2017, Skyrim – Virtual Reality was released for PlayStation 4. On June 10, 2018, Skyrim: Very Special Edition, a voice-activated text adventure game poking fun at the game's many releases, was released for Amazon Alexa devices. On May 3, 2012, The Elder Scrolls Online was revealed. The Elder Scrolls Online was released for Windows and macOS on April 4, 2014, with the Xbox One and PlayStation 4 versions initially slated to follow in June 2014 but later delayed until June 9, 2015. The game originally required a subscription to play, but this requirement was dropped on March 17, 2015. There is however a subscription service entitled "ESO Plus" which grants access to all current and future downloadable content (DLC). The DLC is otherwise available for individual purchase in the Crown Store. Additionally, the optional subscription grants various perks that allow players to progress slightly faster than a free player, and grants them a payment of 1650 crowns per month. On June 14, 2015, The Elder Scrolls: Legends, a collectible card game, was announced by Bethesda during the Electronic Entertainment Expo 2015. It was released on March 9, 2017 for Microsoft Windows and is in beta for Android, iOS, and macOS. At Bethesda's E3 2018 press conference, Todd Howard announced The Elder Scrolls: Blades, originally planned for release in Q3 2018. It is expected to be released for Apple and Android phones first, followed by PC and console, including VR. The player will be able to play as a member of the faction the Blades who has returned home to their town to find it destroyed. There will be a survival, arena, and town-building mode, with multiplayer support through its arena and town-building mode, as well as cross-platform. The game will also be able to be played in portrait mode, unusual for an RPG. The Early access of Blades began March 27, 2019 for those who pre-ordered the game. 'Blades' is expected to fully release some time in early 2019. At Bethesda's E3 2018 press conference, Todd Howard announced The Elder Scrolls VI, which is expected to be released after their next franchise, Starfield. Redfall, a potential title for the game, is subject to a trademark dispute between ZeniMax Media and BookBreeze.com that is set to be settled out of court between the two parties. The Elder Scrolls games are action role-playing games, although they do include elements taken from action and adventure games. In Arena players advance by killing monsters (and thereby gaining experience points) until a preset value is met, whereupon they level-up. However, in Daggerfall, Morrowind, and Oblivion the series took a skill-based approach to character advancement. Players develop their characters' skills by applying them, and only level-up when a certain set of skills have been developed. Skyrim took a new approach, where the more a skill is leveled, the more it helps to level the character. This shifted the focus away from character creation and more onto character development. The flexibility of the games' engines has facilitated the release of game extensions (or mods) through The Elder Scrolls Construction Set. The Elder Scrolls main series of games emphasizes different aspects of the gaming experience than most role-playing games. A brief article by Joystiq in early November 2006 compared BioWare's creations to Bethesda's by noting a difference in emphasis. Bethesda's creations focused on "aesthetic presentation and open-ended adventuring"; BioWare's on a combat system and modular architecture. This overarching aim has been noted by their designers as well. Bethesda has described their motivations in creating the first series game, Arena, as those of any good pen-and-paper role-playing games: creating an environment in which the player could be what the player wants and do what the player wants. Daggerfall's manual begins with a design manifesto, declaring the developers' intention to "create a book with blank pages," and "a game designed to encourage exploration and reward curiosity." Choices, in the form of paths taken by the player, to do good, to chase after evil, are left open to the player, "just like in real life." This design trend continued with Morrowind, following the hiatus of similarly epic games in the interim, though Joystiq's previously noted insistence on graphics came again to the fore. During the development of Morrowind, Bethesda tripled its staff, so as to perfectly color its newly hand-made world. In their own words, "We knew we had to exceed the visual polish of the other games on the market, and we made it our goal to put The Elder Scrolls back into the forefront of game innovation." The Elder Scrolls takes place in a high fantasy world with influences from many real world cultures. Like most works of high or epic fantasy, The Elder Scrolls games are typically serious in tone and epic in scope, dealing with themes of grand struggle against a supernatural or evil force. Many races exist in the world of The Elder Scrolls, some typical of high fantasy works, such as humans, orcs and elves; some atypical, such as the lizard-like Argonians and cat-like Khajiit; and some subversions, such as the extinct Dwemer, known colloquially as "dwarves," who follow the high fantasy stereotype of being subterranean, skilled metallurgists and masons, but are here a variety of elf. As is also typical in high fantasy works, magic and sorcery, mythical creatures, factions with their own political agendas, walled medieval cities and strongholds, and plot elements driven by prophecies and legends can be found in abundance as well. In accordance with many literary high fantasy works, the world of The Elder Scrolls is known for its attention to detail, including well-developed lore and back story. This includes a vast amount of information such as names, dates, and places that constitute its history and the interconnected structure of its various societies, cultures, and religions. Lore, including histories and legends, are contained in thousands of readable in-game books that are scattered throughout the game world. The Elder Scrolls games primarily take place on the continent of Tamriel, located on the world of Nirn. The exceptions are The Elder Scrolls Legends: Battlespire, which is set in a "slipstream" dimension found between the mortal plane of Mundus and the myriad otherworldly planes of Oblivion; portions of The Elder Scrolls IV: Oblivion, which venture into a particular Oblivion plane called the Deadlands, the realm of the Daedric Prince Mehrunes Dagon; the entirety of The Elder Scrolls IV: Oblivion's expansion Shivering Isles, which takes place in the Oblivion plane The Shivering Isles, realm of the Daedric Prince of madness, Sheogorath; and a brief visit to the Oblivion plane of Soul Cairn during the Dawnguard DLC of The Elder Scrolls V: Skyrim; as well as the plane of Apocrypha during the Dragonborn DLC; and the realm of Molag Bal, Coldharbour, which appears in The Elder Scrolls Online. Other continents exist on Nirn aside from Tamriel, such as Akavir, Yokuda, and Atmora, but none have been used as a setting for a game in the series. Tamriel itself is divided into nine provinces or regions, each of which is dominated by a distinct race: Black Marsh is home to the Argonians; Cyrodiil is home to the Imperials; Elsweyr is home to the Khajiit; Hammerfell is home to the Redguards; High Rock is home to the Bretons; Morrowind is home to the Dunmer, or Dark Elves; Skyrim is home to the Nords; Summerset Isle is home to the Altmer, or High Elves; and Valenwood is home to the Bosmer, or Wood Elves. A tenth race, the Orsimer, or Orcs, reside in settlements scattered across Tamriel and, at some points in history, a kingdom inside High Rock known as Orsinium. The major political power in Tamriel's history is the Septim Empire, or Third Empire, centered in Cyrodiil, which at one time or another controlled most of Tamriel's nine provinces. The Empire was founded by Tiber Septim (also known as Talos Stormcrown), who as a Dragonborn, had powerful magical abilities called Shouts. Tiber Septim conquered Tamriel and his dynasty ruled the Empire for several hundred years, at times prospering in peace and other times marred by civil wars and succession crises. During the Oblivion Crisis of The Elder Scrolls IV: Oblivion, a religious cult called The Mythic Dawn opened up dimensional gates to a Hell-like realm called The Deadlands and killed the Emperor Uriel Septim VII and his three sons. The Daedra, beings from the Planes of Oblivion, were eventually defeated, but the end of the Septim dynasty left a severely weakened Empire, which eventually erupted in civil war, allowing many Imperial provinces to break away. As of The Elder Scrolls V: Skyrim, chronologically the latest-set game in the series (taking place in the 201st year of the Fourth Era of recorded history, abbreviated as 4E 201), the balance of power in Tamriel has shifted dramatically. The Third Empire of Tamriel, which once controlled the entire continent, has declined significantly under the new Mede dynasty of emperors; the Empire can claim only High Rock, Skyrim, and the capital province of Cyrodiil for its own. Three of the Empire's former provinces, Black Marsh, Hammerfell, and Morrowind, are effectively independent: Black Marsh and Hammerfell seceded from the Empire, while Imperial forces withdrew from Morrowind after a volcanic eruption and invasion from Black Marsh devastated it. Rising to rival the Empire is the Aldmeri Dominion, which rules the Summerset Isles and Valenwood outright, and claims the kingdoms of Anequina and Pellitine (the remnants of the province of Elsweyr) as client states. After having its capital city sacked, the Empire defeated a Dominion invasion during The Great War, but the effort exhausted it and peace was only achieved by conceding to many of the Dominion's harsh demands by signing the White-Gold Concordat, including ceding parts of Hammerfell and outlawing the worship of Talos. Skyrim is mired in civil war over the question of secession from the Empire, but some of Tamriel's inhabitants believe the conflict is only a distraction from the true looming threat: a second war between the Empire and the Dominion with both sides provoking each other locked in a state of "cold war". The actual Elder Scrolls play a very limited role in the storyline of the series, serving only as a framing plot device (i.e., "[the events in this game] were foretold in the Elder Scrolls..."). The Elder Scrolls themselves are rarely referenced in-game. The Elder Scrolls IV: Oblivion marked the first actual appearance of the Scrolls in the final quest of the Thieves Guild questline. The Scroll itself appears as an incomprehensible chart, containing luminous glyphs. Information about The Elder Scrolls is sparse, and often contradictory. They are thought to be relics from the creation of the Aurbis and the Mundus by the Aedric et'Ada (legendary beings similar to Daedra that sacrificed their immortality to create the world). The Scrolls themselves usually cannot be translated nor transcribed. There exists a sect of monks—the Order of the Ancestor Moths—who devote their lives to the reading and interpreting of the Elder Scrolls. Reading the Scrolls takes a huge toll on the monks' vision. Senior members who read the Scrolls wear blindfolds at all times when they are not divining the Scrolls' content and retired Moth Priests are always completely blind. Attempting to read the Elder Scrolls without training always results in failure and immediate blindness. Cosmically important individuals, or individuals that are the subject of prophecy, have been able to see the unencrypted writing on the Elder Scrolls without the associated rituals or resulting blindness. A book entitled Lost Histories of Tamriel provides further insight on the Elder Scrolls, stating that when any event has actually occurred, it sets itself unchangeably into the Scrolls, and no action, magical or otherwise, can alter this. In The Elder Scrolls V: Skyrim, the Scrolls are described as "fragments of creation" (a reference to the creation-myth associated with the Aedra), and play a vital role in the main quest-line. They are said to be very powerful artifacts and without training or worthiness, one may go insane trying to decipher them. The player is tasked with retrieving an Elder Scroll from an expansive Dwemer ruin known as Blackreach, located underground. During gameplay, if the player tries to read the Elder Scroll, they will go temporarily blind. It is discovered that the Elder Scroll was used by the ancient Nords to battle Alduin, the ancient Dragon prophesied to swallow the world, inadvertently sending him forward in time. The player character uses the Scroll to travel back in time to gain the knowledge of how the Nords were able to combat Alduin. It is also described that the number of the Scrolls is unknown not because of their immense quantity, but because the number itself is unknowable, as the Scrolls "do not exist in countable form." The actual number and placement of Elder Scrolls fluctuates constantly as it is said that they technically exist and do not exist at the same time. This makes their predictions difficult to cite authoritatively because entire Scrolls or entries can change or vanish as events transpire. This unpredictability has caused other ascetic groups, such as the Greybeards from Skyrim, to find the existence of the Elder Scrolls a blasphemy. In The Elder Scrolls V: Dawnguard, Lord Harkon attempts to use the Elder Scrolls to blot out the sun so that the vampires can overwhelm Tamriel. Whether the player joins the vampires or the vampire hunters referred to as the Dawnguard, they will find a Moth Priest, Dexion Evicus, to read the Scrolls that are collected. Once collected, the Moth Priest reveals that he has become blind, not having prepared himself properly in his hurry to read the first Scroll. So he tells the player of a ritual allowing the player to read the Scrolls. The ritual involves harvesting bark from a special Canticle Tree and using it to bring Ancestor Moths to a shaft of light and reading all three Scrolls to find Auriel's Bow. The Moth Priest Dexion states that Ancestor Moths can give a person the connection to the divine augur that is necessary to truly read the Scrolls. At E3 2016, Bethesda Game Studios director Todd Howard reported that the studio was already working on a sixth installment in The Elder Scrolls franchise, although it would still be "a very long way off" and at E3 2017, Bethesda Softworks vice president of public relations stated that no new title was in active development, and that they have "at least two major titles" to complete before this would change. At E3 2018, Howard revealed a small teaser trailer for The Elder Scrolls VI and announced that it would be released following Starfield. In 2009, science-fiction author Gregory Keyes released The Elder Scrolls: The Infernal City, a novel set approximately 40 years after the Oblivion Crisis. Lord of Souls was released in 2011 as Keyes' second novel in his The Elder Scrolls book series. On August 1, 2013, Bethesda revealed The Elder Scrolls Anthology for the PC, a compilation of all five of The Elder Scrolls games, including all of the expansions to Morrowind, Oblivion and Skyrim. In 2012, Complex ranked The Elder Scrolls at number 20 on the list of the best video game franchises. In 2013, The Elder Scrolls was voted as the Greatest Game Series of the Decade on GameSpot, beating out 64 other competitors. The Elder Scrolls reached the final round, beating the Grand Theft Auto series by a margin of 52.5% of the vote for The Elder Scrolls to 47.5% for Grand Theft Auto. In August 2011, Bethesda Softworks contacted the developer of Minecraft, Mojang, claiming that the intended trademark of the title Scrolls for its new game breached Bethesda's trademark on The Elder Scrolls. On March 10, 2012, Markus Persson tweeted that the two had come to an agreement over the use of the name. The agreement prohibits Mojang from using the title Scrolls in any future sequels of the game. The Elder Scrolls IV: Oblivion - 9.5 million sold Kollar, Philip (November 10, 2015). "Fallout 4 could be a bigger hit than Skyrim". Polygon. Vox Media. Archived from the original on November 13, 2015. Retrieved November 13, 2015. The Elder Scrolls V: Skyrim - 30 million sold "'Skyrim' Creator Todd Howard Talks Switch, VR and Elder Scrolls Wait". The Elder Scrolls Online - 8.5 million sold Royce, Brianna (February 13, 2017). "Elder Scrolls Online now boasts 8.5M players". Massively Overpowered. Retrieved June 25, 2017. ^ a b c d e f Blancato, Joe (February 6, 2007). "Bethesda: The Right Direction". The Escapist. Archived from the original on April 3, 2007. Retrieved June 1, 2007. ^ a b "Game Browser: Bethesda Softworks LLC". MobyGames. Retrieved June 9, 2007. ^ a b c d e f g h i j k l m n o "Ted Peterson Interview I". Morrowind Italia. April 9, 2001. Archived from the original on October 13, 2007. Retrieved June 8, 2007. ^ a b c d e f "Arena - Behind the Scenes". The Elder Scrolls 10th Anniversary. Bethesda Softworks. 2004. Archived from the original on May 9, 2007. Retrieved June 8, 2007. ^ a b c d Barton, Matt (April 11, 2007). "The History of Computer Role-Playing Games Part III: The Platinum and Modern Ages (1994–2004)". Gamasutra. Archived from the original on June 11, 2007. Retrieved June 8, 2007. ^ a b c "Daggerfall - Behind the Scenes". The Elder Scrolls 10th Anniversary. Bethesda Softworks. 2004. Archived from the original on May 9, 2007. Retrieved June 9, 2007. ^ "Daggerfall". Next Generation Magazine (11): 82–5. November 1995. ^ "Daggerfall release dates". GameSpot. Archived from the original on September 29, 2007. Retrieved July 9, 2007. ^ "Battlespire". Next Generation Magazine (34): 124–5. October 1997. ^ a b "Battlespire - Behind the Scenes". The Elder Scrolls 10th Anniversary. Bethesda Softworks. 2004. Archived from the original on June 9, 2007. Retrieved June 13, 2007. ^ "Battlespire release dates". GameSpot. Archived from the original on September 30, 2007. Retrieved June 14, 2007. ^ "Redguard release dates". GameSpot. Archived from the original on September 30, 2007. Retrieved June 14, 2007. ^ a b c "Morrowind, Behind the Scenes". Bethesda Softworks. 2004. Archived from the original on November 14, 2006. Retrieved November 22, 2006. ^ Qwerty (July 2001). "Interview with Morrowind Developers". The Interviews. Game. EXE. Reprinted in The Imperial Library. Archived from the original on September 28, 2010. Retrieved October 18, 2010. ^ IGN Staff (October 27, 2000). "Elder Scrolls III: Morrowind Interview 2". IGN. Archived from the original on February 10, 2007. Retrieved May 14, 2007. ^ "Development Team Chat No. 1". VoodooExtreme. July 19, 2000. Archived from the original on October 19, 2007. Retrieved September 20, 2006. ^ Ultimate (July 9, 2001). "Ted Peterson Interview II". Archived from the original on November 12, 2007. Retrieved June 14, 2007. ^ "The Elder Scrolls III: Morrowind for PC goes gold". Bethesda Softworks. April 23, 2002. Archived from the original on August 12, 2002. Retrieved August 15, 2013. ^ Walker, Trey (April 23, 2002). "Morrowind goes gold". GameSpot. Archived from the original on September 30, 2007. Retrieved May 8, 2007. ^ "PC release dates". GameSpot. Archived from the original on June 17, 2006. Retrieved September 30, 2006. ^ "The Elder Scrolls III: Morrowind for Xbox headed to stores". Bethesda Softworks. June 4, 2002. Archived from the original on August 4, 2002. Retrieved August 15, 2013. ^ "Ubi Soft signs major publishing contract with Bethesda Softworks to distribute multiple titles in Europe". Bethesda Softworks. January 3, 2002. Archived from the original on March 17, 2007. Retrieved May 8, 2007. ^ a b Parker, Sam (September 6, 2002). "Tribunal to expand world of Morrowind". GameSpot. Archived from the original on September 30, 2007. Retrieved May 22, 2007. ^ McNewserson, Newsey (November 8, 2002). "Elder Scrolls III: Tribunal Ships". IGN. Archived from the original on May 22, 2007. Retrieved May 19, 2007. ^ "Tribunal release dates". GameSpot. Archived from the original on September 30, 2007. Retrieved May 19, 2007. ^ a b Staff (October 11, 2002). "The Elder Scrolls III: Tribunal Q&A". GameSpot. Archived from the original on September 29, 2007. Retrieved May 19, 2007. ^ Abner, William (December 8, 2002). "Morrowind: Tribunal Review, page 1". GameSpy. Archived from the original on October 19, 2006. Retrieved September 20, 2006. Brenesal, Barry (December 9, 2002). "Elder Scrolls III: Tribunal Review, page 1". IGN. Archived from the original on August 4, 2006. Retrieved September 20, 2006. Desslock (November 21, 2002). "Elder Scrolls III: Tribunal Review, page 2". GameSpot. Archived from the original on September 30, 2007. Retrieved May 19, 2007. ^ Parker, Sam (May 23, 2003). "Morrowind expansion goes gold". GameSpot. Archived from the original on February 11, 2007. Retrieved May 20, 2007. ^ "Bloodmoon release dates". GameSpot. Archived from the original on September 30, 2007. Retrieved May 20, 2007. ^ Staff (May 30, 2003). "The Elder Scrolls III: Bloodmoon Q&A". GameSpot. Archived from the original on September 30, 2007. Retrieved May 20, 2007. ^ Liebl, Matt (October 26, 2011). "The Graphical Advancements of Skyrim: A Comparison to Oblivion". GameZone. GameZone Online. Archived from the original on January 27, 2013. ^ Thorsen, Tor (September 10, 2004). "Elder Scrolls IV coming to PC, next-gen". GameSpot. Archived from the original on September 30, 2007. Retrieved May 26, 2007. ^ "Bethesda Softworks Signs Co-Publishing Agreement with Take-Two Interactive for The Elder Scrolls IV: Oblivion". Bethesda Softworks. February 3, 2005. Archived from the original on February 7, 2005. Retrieved August 15, 2013. ^ Thorsen, Tor (February 3, 2005). "Take-Two to copublish Elder Scrolls IV, Cthulhu". GameSpot. Archived from the original on September 30, 2007. Retrieved May 26, 2007. ^ Thorsen, Tor (October 31, 2005). "Elder Scrolls IV missing Xbox 360 launch". GameSpot. Archived from the original on September 29, 2007. Retrieved May 26, 2007. Valerias (December 10, 2005). "Oblivion: Release Date Dramas". GameSpy. Archived from the original on February 23, 2013. Retrieved May 27, 2007. ^ Howard, Todd. "The RPG for the Next Generation". Bethesda Softworks. Archived from the original on March 20, 2007. Retrieved March 26, 2007. ^ Stargleman (May 29, 2005). "E3 2005 Coverage: Gavin Carter". GameSpy. Archived from the original on October 19, 2007. Retrieved May 27, 2007. ^ Callaham, John (September 26, 2005). "Elder Scrolls IV: Oblivion Interview". Gamecloud. Archived from the original on November 3, 2005. Retrieved June 2, 2007. ^ Houghton, Mat. "Developers Corner: The Elder Scrolls IV: Oblivion". Game Chronicles. Archived from the original on August 21, 2007. Retrieved August 11, 2007. ^ Husemann, Charles (June 2, 2005). "Elder Scrolls IV: Oblivion Interview". Gaming Nexus. Archived from the original on August 16, 2007. Retrieved August 11, 2007. ^ Shuman, Sid (May 23, 2006). "Living in Oblivion". Games.Net. Archived from the original on March 12, 2007. Retrieved August 15, 2013. ^ Hammond, Alex (March 25, 2005). "The Elder Scrolls IV: Oblivion Interview". Gameplay Monthly. Archived from the original on February 12, 2006. Retrieved August 15, 2013. ^ "Oblivion interview - Gavin Carter of Bethesda". Elite Bastards. October 20, 2005. Archived from the original on June 9, 2007. Retrieved June 1, 2007. ^ dela Fuente, Derek (July 20, 2005). "Elder Scrolls IV: Oblivion - Q&A". TVG. Archived from the original on February 22, 2008. Retrieved June 2, 2007. ^ "The Elder Scrolls IV: Oblivion Interview with Gavin Carter". RPGamer. Archived from the original on September 30, 2007. Retrieved June 17, 2007. ^ Berry, Noah. "A Brief History of Cyrodiil". Bethesda Softworks. Archived from the original on May 9, 2007. Retrieved June 2, 2007. ^ "PS3 Oblivion Shelved Till Next Year". 1Up.com. Archived from the original on February 24, 2013. ^ IGN (March 27, 2007). "The Elder Scrolls IV: The Shivering Isles". IGN. ^ Tom Branwell (August 16, 2010). "Bethesda's Todd Howard (interview)". www.eurogamer.net. Eurogamer. Archived from the original on February 3, 2013. ^ Wesley Yin-Poole (November 23, 2010). "Rumour: Elder Scrolls 5 in the works". www.eurogamer.net. Eurogamer. Archived from the original on November 26, 2010. ^ Kristian West (November 22, 2010). "The Elder Scrolls V på vej". www.eurogamer.dk (in Danish). Eurogamer. Archived from the original on November 26, 2010. ^ David Hughes (December 12, 2010). "Bethesda unveils Elder Scrolls V, confirms direct sequel to Oblivion". www.huliq.com. Archived from the original on April 11, 2013. ^ "PC Game of the Year". IGN. Archived from the original on January 8, 2012. ^ "2011 Spike Video Game Awards: Complete Winners List". Game Rant. Archived from the original on January 26, 2013. ^ "The Elder Scrolls V: Skyrim – Dragonborn on Steam". Archived from the original on March 22, 2015. ^ "The Elder Scrolls V: Skyrim – VR on Playstation store". ^ Dyer, Mitch (December 11, 2013). "The Elder Scrolls Online PC and Mac, Xbox One, and PS4 Release Dates Announced - IGN". IGN. Retrieved December 11, 2013. ^ Stephany Nunneley (January 21, 2015). "The Elder Scrolls Online drops subs, console release date announced". VG247. Archived from the original on January 21, 2015. Retrieved January 21, 2015. ^ "The Elder Scrolls Online: Tamriel Unlimited FAQ". The Elder Scrolls Online. ZeniMax. January 21, 2015. Retrieved January 21, 2015. ^ Grayson, Nathan. "The Elder Scrolls Blades Announced For Phones". Kotaku. Retrieved June 11, 2018. ^ "The next Elder Scrolls game is a beautiful mobile RPG named Blades". The Verge. Retrieved June 11, 2018. ^ Hall, Charlie (November 29, 2018). "Bethesda delays The Elder Scrolls: Blades into 2019". Polygon. ^ a b "Bethesda announces The Elder Scrolls 6". Eurogamer.net. Retrieved June 11, 2018. ^ Delahunty-Light, Zoe (March 21, 2019). "Don't worry about that Elder Scrolls 6 Redfall trademark dispute: an agreement could be in the works". GamesRadar+. ^ Rose, Alan (November 3, 2006). "Neverwinter Nights 2, Metareview". Joystiq. Archived from the original on November 5, 2006. ^ "Arena, Behind the Scenes". The Elder Scrolls Tenth Anniversary. Bethesda Softworks. 2004. Archived from the original on December 11, 2007. ^ (1996) Bethesda Softworks Daggerfall Instruction Manual Bethesda Softworks, 1–2. ^ "Morrowind, Behind the Scenes". The Elder Scrolls Tenth Anniversary. Bethesda Softworks. 2004. Archived from the original on November 14, 2006. ^ "Lore:Nirn - UESPWiki". Uesp.net. Archived from the original on November 5, 2013. Retrieved November 16, 2013. ^ "Fourth Era". Imperial Library. Archived from the original on November 29, 2011. Retrieved December 4, 2011. ^ a b c Bethesda Game Studios (April 30, 2007). The Elder Scrolls IV: Oblivion. Bethesda Softworks, 2K Games. ^ "Lost Histories of Tamriel". UESP. Archived from the original on February 11, 2011. Retrieved January 18, 2011. ^ Skrebels, Joe (June 13, 2016). "E3 2016: Bethesda Is Working on The Elder Scrolls 6". IGN. IGN Entertainment. Retrieved June 13, 2017. ^ Brown, Fraser (June 13, 2017). "The Elder Scrolls 6 isn't in development". PC Gamer. Future US. Archived from the original on June 13, 2017. Retrieved June 13, 2017. ^ "The Complete Elder Scrolls Collection comes to PC this September (Updated)". August 7, 2013. Archived from the original on August 10, 2013. Retrieved August 10, 2013. ^ "The Elder Scrolls: Arena Reviews". GameRankings. Archived from the original on January 9, 2015. Retrieved February 6, 2015. ^ "The Elder Scrolls II: Daggerfall Reviews". GameRankings. Archived from the original on January 9, 2015. Retrieved February 6, 2015. ^ "An Elder Scrolls Legend: Battlespire Reviews". GameRankings. Archived from the original on January 10, 2015. Retrieved February 6, 2015. ^ "The Elder Scrolls Adventures: Redguard Reviews". GameRankings. Archived from the original on January 10, 2015. Retrieved February 6, 2015. ^ "The Elder Scrolls III: Morrowind Reviews". GameRankings. Archived from the original on January 9, 2015. Retrieved February 6, 2015. ^ "The Elder Scrolls III: Morrowind Reviews". GameRankings. Archived from the original on October 12, 2014. Retrieved February 6, 2015. ^ "The Elder Scrolls III: Morrowind Reviews". Metacritic. Archived from the original on February 23, 2015. Retrieved February 6, 2015. ^ "The Elder Scrolls III: Morrowind Reviews". Metacritic. Archived from the original on February 26, 2015. Retrieved February 6, 2015. ^ "The Elder Scrolls III: Tribunal Reviews". GameRankings. Archived from the original on February 7, 2015. Retrieved February 6, 2015. ^ "The Elder Scrolls III: Tribunal Reviews". Metacritic. Archived from the original on January 18, 2015. Retrieved February 6, 2015. ^ "The Elder Scrolls III: Bloodmoon Reviews". GameRankings. Archived from the original on February 7, 2015. Retrieved February 6, 2015. ^ "The Elder Scrolls III: Bloodmoon Reviews". Metacritic. Archived from the original on February 21, 2015. Retrieved February 6, 2015. ^ "The Elder Scrolls Travels: Shadowkey". GameRankings. Archived from the original on February 3, 2017. Retrieved February 3, 2017. ^ "The Elder Scrolls IV: Oblivion Reviews". GameRankings. Archived from the original on December 3, 2014. Retrieved February 6, 2015. ^ "The Elder Scrolls IV: Oblivion Reviews". GameRankings. Archived from the original on January 7, 2015. Retrieved February 6, 2015. ^ "The Elder Scrolls IV: Oblivion Reviews". Metacritic. Archived from the original on January 29, 2015. Retrieved February 6, 2015. ^ "The Elder Scrolls IV: Oblivion Reviews". Metacritic. Archived from the original on February 3, 2015. Retrieved February 6, 2015. ^ "The Elder Scrolls IV: Knights of the Nine Reviews". GameRankings. Archived from the original on February 7, 2015. Retrieved February 6, 2015. ^ "The Elder Scrolls IV: Knights of the Nine Reviews". Metacritic. Archived from the original on June 22, 2015. Retrieved February 6, 2015. ^ "The Elder Scrolls IV: Shivering Isles Reviews". GameRankings. Archived from the original on February 7, 2015. Retrieved February 6, 2015. ^ "The Elder Scrolls IV: Shivering Isles Reviews". Metacritic. Archived from the original on June 1, 2015. Retrieved February 6, 2015. ^ "The Elder Scrolls IV: Shivering Isles Reviews". Metacritic. Archived from the original on June 22, 2015. Retrieved February 6, 2015. ^ "The Elder Scrolls V: Skyrim Reviews". GameRankings. Archived from the original on February 7, 2015. Retrieved February 6, 2015. ^ "The Elder Scrolls V: Skyrim Reviews". GameRankings. Archived from the original on February 3, 2015. Retrieved February 6, 2015. ^ "The Elder Scrolls V: Skyrim Reviews". GameRankings. Archived from the original on February 21, 2015. Retrieved February 6, 2015. ^ "The Elder Scrolls V: Skyrim Reviews". Metacritic. Archived from the original on July 10, 2017. Retrieved February 6, 2015. ^ "The Elder Scrolls V: Skyrim Reviews". Metacritic. Archived from the original on February 8, 2015. Retrieved February 6, 2015. ^ "The Elder Scrolls V: Skyrim Reviews". Metacritic. Archived from the original on February 10, 2015. Retrieved February 6, 2015. ^ "The Elder Scrolls V: Skyrim – Dawnguard Reviews". GameRankings. Archived from the original on February 7, 2015. Retrieved February 6, 2015. ^ "The Elder Scrolls V: Skyrim – Dawnguard Reviews". Metacritic. Archived from the original on February 24, 2015. Retrieved February 6, 2015. ^ "The Elder Scrolls V: Skyrim – Dawnguard Reviews". Metacritic. Archived from the original on June 6, 2017. Retrieved February 6, 2015. ^ "The Elder Scrolls V: Skyrim – Dawnguard Reviews". Metacritic. Archived from the original on March 3, 2015. Retrieved February 6, 2015. ^ "The Elder Scrolls V: Skyrim – Hearthfire Reviews". GameRankings. Archived from the original on February 7, 2015. Retrieved February 6, 2015. ^ "The Elder Scrolls V: Skyrim – Hearthfire Reviews". Metacritic. Archived from the original on February 25, 2015. Retrieved February 6, 2015. ^ "The Elder Scrolls V: Skyrim – Hearthfire Reviews". Metacritic. Archived from the original on March 30, 2015. Retrieved February 6, 2015. ^ "The Elder Scrolls V: Skyrim – Dragonborn Reviews". GameRankings. Archived from the original on February 7, 2015. Retrieved February 6, 2015. ^ "The Elder Scrolls V: Skyrim – Dragonborn Reviews". Metacritic. Archived from the original on March 20, 2015. Retrieved February 6, 2015. ^ "The Elder Scrolls V: Skyrim – Dragonborn Reviews". Metacritic. Archived from the original on February 17, 2015. Retrieved February 6, 2015. ^ "The Elder Scrolls V: Skyrim – Dragonborn Reviews". Metacritic. Archived from the original on July 14, 2017. Retrieved February 6, 2015. ^ "The Elder Scrolls Online Reviews". GameRankings. Archived from the original on February 15, 2015. Retrieved February 6, 2015. ^ "The Elder Scrolls Online Reviews". Metacritic. Archived from the original on February 8, 2015. Retrieved February 6, 2015. ^ "The Elder Scrolls: Legends Reviews". GameRankings. Archived from the original on June 29, 2017. Retrieved August 1, 2017. ^ "The Elder Scrolls: Legends Reviews". GameRankings. Archived from the original on August 1, 2017. Retrieved August 1, 2017. ^ "The Elder Scrolls: Legends Reviews". Metacritic. Archived from the original on April 14, 2017. Retrieved August 1, 2017. ^ Elton Jones (September 25, 2012). "The Elder Scrolls - The 50 Best Video Game Franchises - Complex". Complex. Archived from the original on September 28, 2012. ^ "Greatest Game Series of the Decade winner: The Elder Scrolls". GameSpot. September 30, 2013. Archived from the original on November 18, 2013. Retrieved November 16, 2013. ^ Elder Scrolls voted game series of the decade (September 12, 2013). "Elder Scrolls voted game series of the decade". Attack of the Fanboy. Archived from the original on November 23, 2013. Retrieved November 16, 2013. ^ "Minecraft studio threatened with suit by Bethesda over 'Scrolls' title". Engadget. Archived from the original on October 28, 2012. ^ "Mojang can't use 'Scrolls' in any sequels to 'Scrolls,' lawsuit dictates". Engadget. This page was last edited on 17 April 2019, at 19:21 (UTC).